Azure, Microsoft's cloud, provides dozens of services to make cloud development fast without the need to worry about infrastructure such as hardware. 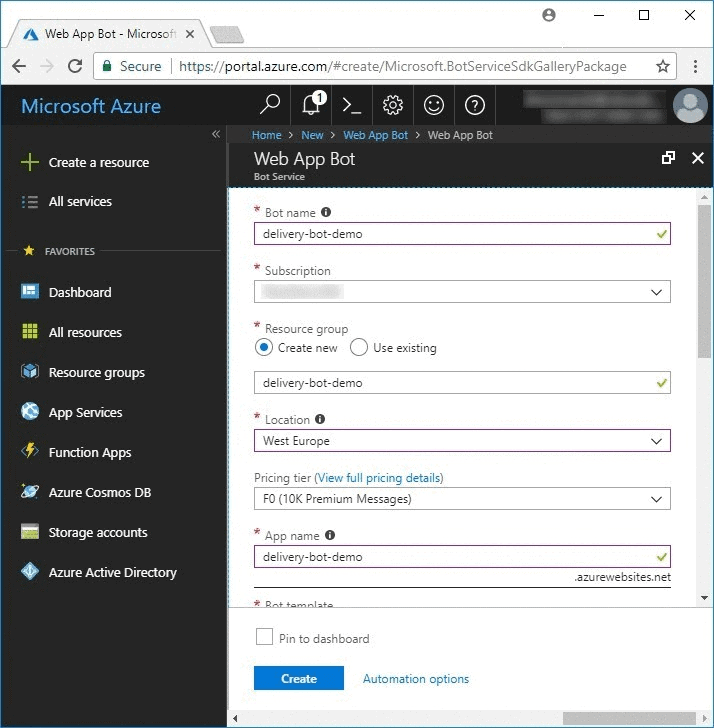 In this article, Jakub Kaczmarek explains the benefits and challenges of creating a bot using the Microsoft Bot Framework found on Azure. He also walks you through creating a simple bot. Bots may have been known for decades, but they were used mostly in simple applications rather than for serious business cases. However, recently they became more intelligent, complex, and versatile. Nowadays bots can do much more, with multiple communication channel support and features such as natural language understanding or user intention recognition. They are a part of a cloud revolution which brought software to a new level, providing great availability and scalability for low development effort and maintenance cost. This article is focused on the Bot Framework – Microsoft’s cloud solution for bot development. We are used to communicating through web or mobile communicators – millions of people using Facebook Messenger proves that. The good news is that bots can converse with us through some highly anticipated channels. That brings your company communication to a new level. Bot service is available 24 hours per day and can be designed to handle typical questions asked by people, which may reduce the staff needed to maintain such channels. You can provide instant support for your customers, partners and new leads. Another advantage of this kind of communication interface is the fact that it doesn’t need an expensive and laborious process of bringing up an application UI. A bot usually communicates with the user using plain text through the channel that already provides a user interface. Depending on the channel, it has also a set of built-in components that can be used to display bot responses in a more attractive way. You can use images, videos, audio clips, buttons and lists of items not only to present the content, but also to interact with the user. A bot can make use of Q&A knowledge to receive user question and provide an appropriate answer. Questions can be matched to correct answers using a LUIS (language understanding intelligent service) cognitive service. Reduced time can be spent by help desk staff answering typical questions. Example use cases are help chat, contact pages and web stores. By integrating a bot with external systems (e.g. Outlook, Jira, CRM, SharePoint) a bot can become an alternative interface to work with these systems. A bot can simply ask some questions and gather the answers given by the user to submit data that normally would be filled in on a form. 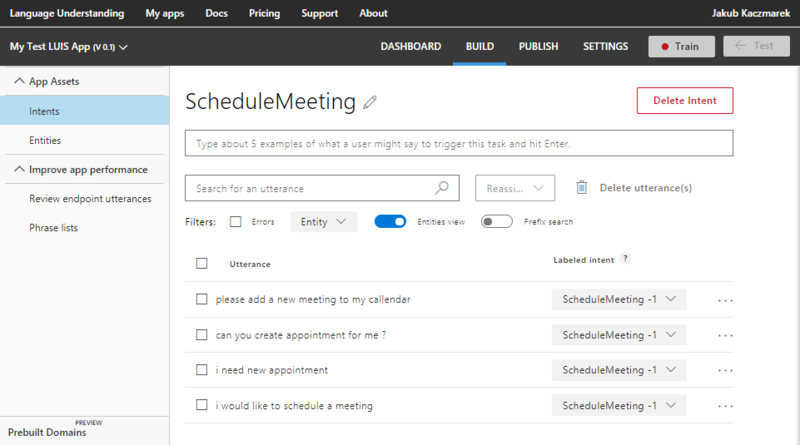 Example use cases are creating support tickets, uploading SharePoint documents, making calendar appointments, and providing translations. A bot can be also used to entertain and educate its recipients by sending various kinds of content to the user. It’s a good idea to use media types like videos, audio, images and links to knowledge base articles. Example use cases are workout coach, recipes book and product adviser. A bot can be scheduled to initialize conversations at appropriate time, notifying the user about some actions or reminding about things he should do. It’s important to remember that sending proactive messages is not always possible – it depends on the channel used for communication. Example use cases are meeting reminders and timesheet reminders. When I joined a team assembled to develop a bot, I was confused – is it really the kind of software desired by enterprise customers? Then I realized I’m asking the same questions I asked about web applications eight years ago. Since then, a lot of desktop and on-premise systems were migrated to the cloud. Web applications became a crucial part of this process. Maybe it’s also a good idea to give bots a chance? Cost efficiency – Azure cloud allows selecting a fitting application service plan, depending on your needs. For applications generating small traffic, the cost is very small or even free. Scalability and reliability – you don’t need to bother with what will happen if the traffic rapidly increases. Applications hosted on Azure can scale up to handle higher traffic and scale down when it’s over. The availability of cloud services is also typically much higher compared to in-house IT infrastructure. Convenience – by hosting an application on the cloud, we don’t need to care about the infrastructure. This is also significant cost reducer, ruling out the necessity of purchasing, managing and administering a local server room. Easy provisioning and deployment – there are tools allowing you to define the details of application services and other resources needed to host it. 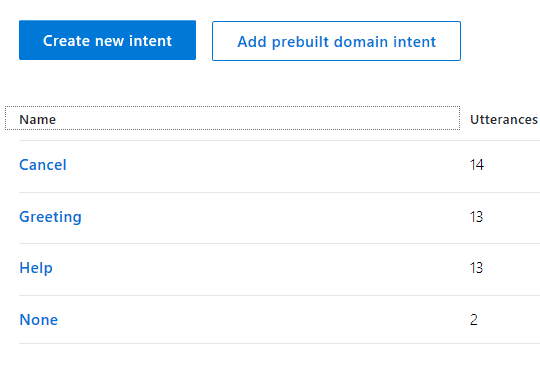 As an example, you can use ARM templates with Cake build script to build your code, provision resources on target Azure subscription with correct settings, and deploy compiled application from your local command line or build server. Integration with other systems – cloud computing makes it easy to connect web application with other systems, sharing the data or events amongst each other. That allows building well-integrated applications with relatively small effort. Cold starts – an application might get expropriated to release resources for other applications running on the server. That typically happens when the app remains idle for a long time. It’s still available, but the first time it’s called after a long idle period, you might experience a longer loading phase. This disadvantage is undesirable especially for bots, where a quick response is a key feature. However, a cold start is typical for lower app service plans and can be fixed by upgrading the plan. Security – a typical web application stores some data in the database. Usually the database is also hosted in the cloud, which mean it’s potentially vulnerable. Localization – the fact that cloud servers are located in other countries may become a problem for some customers, depending on their security policy. The Microsoft Bot Framework comes with out-of-the-box support for number of channels, e.g. Skype, Skype for Business, Microsoft Teams, Facebook Messenger. Bot Service allows defining which channels are enabled for a bot and handles communication with these channels. All messages received by this service are getting posted to bot web API, returning the message that is getting sent back to the user. The Web API Service provides an endpoint responsible for answering user activities. It’s the developer’s responsibility to implement this logic. However, the Bot Framework makes this job easier by introducing the concept of bot dialogs and a set of interfaces and types. The Bot Web API is also a service in which integration with external systems and services should be implemented. 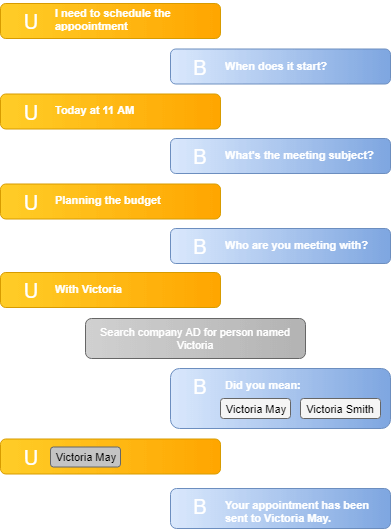 The conversation between a bot and a user is the most basic feature the Bot Framework provides. To make it efficient and fast, a conversation state is stored to the Bot State Service each time a new activity is being recorded. It helps to keep the asynchronous nature of Bot Web API and Bot Service. Bot state can be cached in memory or stored in persistent storage. Thanks to the fact that a bot state, kept in a database, is restorable at any point of time, it is possible to develop a bot capable of continuing previously initialized conversations. Note: In the beginning, Bot Framework shipped with the default State Service which was built into Bot Service. However, it’s going to be deprecated in a future release. It’s recommended to use other storage services like Azure Storage or Cosmos DB for bot state, especially for production bots. Microsoft Bot Framework allows development of great bots. However, it’s just a set of tools – we don’t get a ready-to-use bot right after creating the project. Typically, a bot needs development to bring some functionalities. It’s good to realize what kind of challenges we might be faced with. If the bot is about to converse with the user, it should have a form of intelligence. The most basic intelligence can be implemented programmatically using if or switch instructions. However, for more complex scenarios it’s usually not enough. 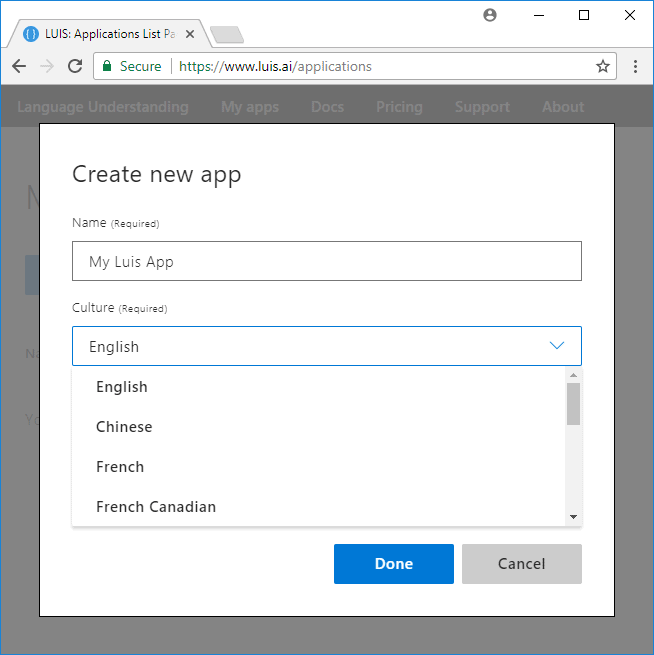 Luckily, Microsoft provides the Language Understanding Intelligent Service (LUIS) – a powerful cloud service providing natural language understanding features. This service allows anyone to build a custom cognitive language understanding model in an intuitive way – simply by providing some utterances and matching them with correct intents. Figure 3 shows an example of the design interface. Figure 3. Defining LUIS intents and utterances. 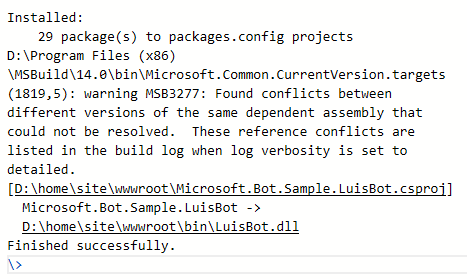 In addition to that, Microsoft Bot Framework comes with out-of-the box support for LUIS services to provide easy integration. It’s worth keeping in mind that LUIS has a limited quota for a free usage per month, and it might be necessary to upgrade to a paid consumption plan. The architecture of Bot Framework is based on web services communicating with each other in an asynchronous way. That is the reason why the user does not receive bot responses immediately. The exact response time depends on the channel, but it’s typically up to a few seconds. However, if bot services are configured for free or basic consumption plans, the response time might elevate to tens of seconds during the cold starts. A basic bot can be implemented to communicate in any language, as long as messages sent by the user can be recognized by its logic. Things get more complicated for bots using LUIS service – it has support for a limited set of languages, and only one of them can be selected per each service instance (Figure 4). This means that, for multi-language bots, there may be a need to register and maintain multiple LUIS services, which might increase the costs. In some cases, the functionality of a bot depends on integration with other systems. This is potentially a part of the code that might cause long response times. Therefore, the integration between the bot Web API service and an external service needs to be developed carefully, focusing on good performance. If the integration requires time-consuming queries, it might be a good idea to delegate these tasks to other cloud services like Azure Functions or Azure Web Jobs to cache the results in storage available for the bot. It’s worth taking advantage of the features each channel offers to bots, especially because it’s easy to develop. However, you need to be aware that the Bot Framework doesn’t guarantee all components will be available and will look and behave the same way on all available channels. You can check and compare channels features on Bot Framework Channel Inspector. Creating a new intelligent bot was a challenge when the Bot Framework was initially introduced. However, as the framework is being constantly improved by Microsoft, the development became much easier. Let’s see how to create a new bot with the language understanding feature called Delivery bot. Figure 6. Bot provisioning details form. Bot name: the name of the bot, that will be presented to the user. Note that it must be unique across Azure, so you will need to choose a different name. Location: the region in which the bot will be hosted; it’s recommended to pick a location that is close to the target audience to provide shorter responses times. Pricing tier: you can pick either free (F0) or paid (S1) plan for your bot. 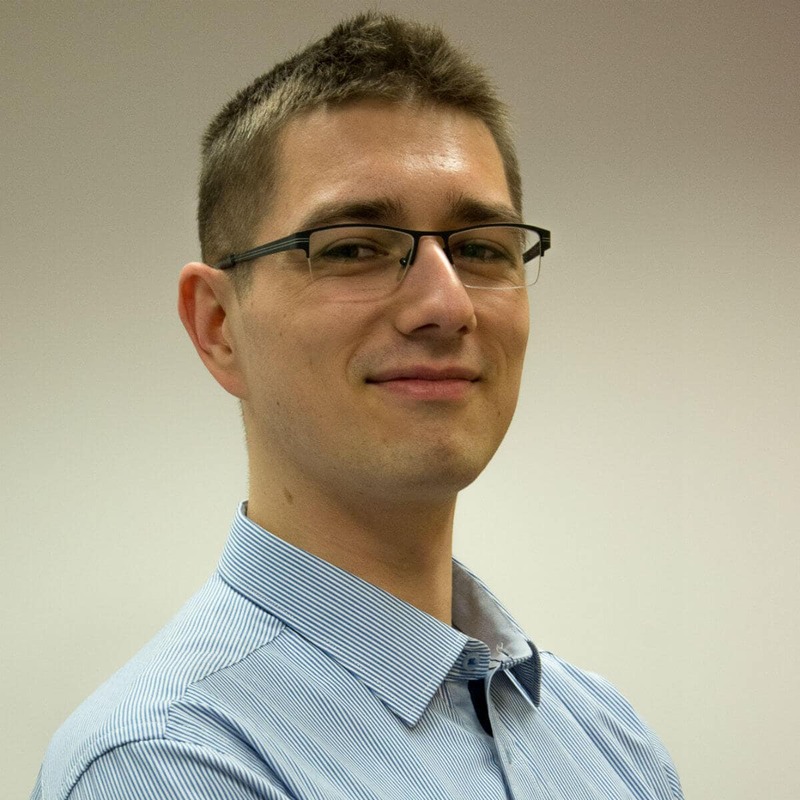 Bot template: allows you to initialize a bot messaging endpoint with ready-to-work code; for this example, choose Language understanding (C#) template that will also initialize a new LUIS application. App service plan/Location: allows to create or select existing service plan, determining what compute resources will be available for Bot Web API Service. It is recommended to choose a service plan located in the same region as the location of bot resources being created. 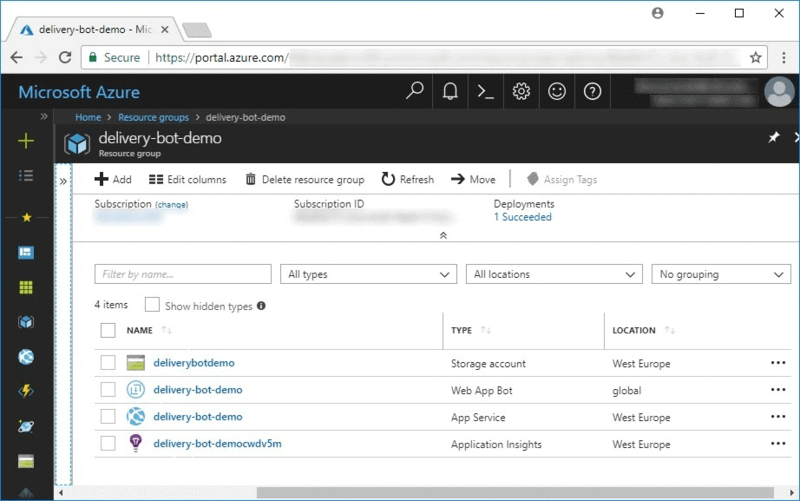 Azure storage: the storage that will be used to keep the state of the bot; in this example, create a new one. Application Insights – for bot analytics and telemetry. Before starting a new conversation, you must put in some development effort to let bot understand your business cases. In this example, the bot is targeted for a logistics company. That’s why you need to teach it to understand some example questions the customer might ask. To do this, you need to dive deeper into the LUIS service. You might have noticed that this service is not available in resources listed on Azure Portal in the new resources group. That’s because LUIS is a separate service and doesn’t get included as an Azure resource. LUIS applications can be explored on the luis.ai portal after signing in using the same credentials as for the Azure Portal. However, as Europe and Australia regions have their own subdomains (for performance reasons), the LUIS service localized in the European region is accessible on eu.luis.ai portal. You can learn more about LUIS regions here. When you sign in to the LUIS portal, you’ll see the service you just created in the applications directory shown in Figure 8. Note that you will need to change the URL based on your region. How can I send a new parcel? What should I do to send a parcel? What is my parcel delivery status? When will you deliver my package? Figure 10 shows the interface used to create the intents. Once the two new intents are created, you’ll see them in the Intents list as shown in Figure 11. Once the training process is done, you can test it using the test tool available on the LUIS portal by clicking the Test button in the header. However, the fact that the service is trained doesn’t mean that changes you made are already available for the bot. 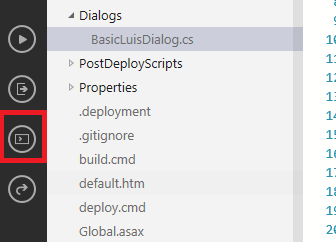 Before making use of new intents, you need to publish a new version of LUIS. To do this you need to go to the Publish section and click the Publish to production slot button. Now it’s time to start using the new LUIS intents in your bot. This means you need to make some changes in the bot messaging endpoints code. 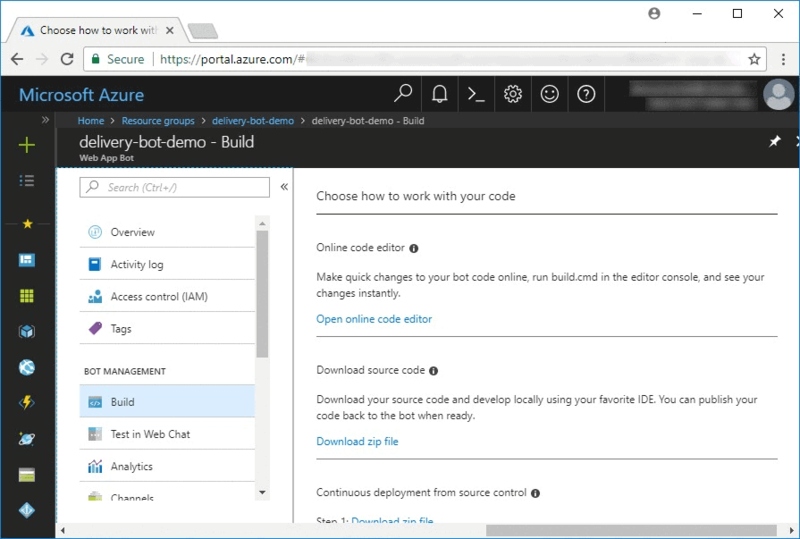 The easiest way to get access to the code is to open the Build section of the Web App Bot resource available in the bot resource group on the Azure Portal as shown in Figure 13. Figure 14 shows these details. The implementation of the LUIS dialog is based on public methods decorated with LuisIntent annotation. This decorator requires an intent name parameter. Once the method is properly decorated, it becomes an event handler of matching LUIS intent in scope of the current dialog. Under the hood, the Bot Framework is forwarding each message sent by the user to the LUIS service and waits for the response. The Language Understanding service matches the input message with all intents and returns a score table as a response. Finally, the Bot Framework receives the response and triggers the method associated with the best-scoring intent. Having modified the bot code, you need to build it. To do this, open the console section available in online editor. Type in build.cmd and press Enter. 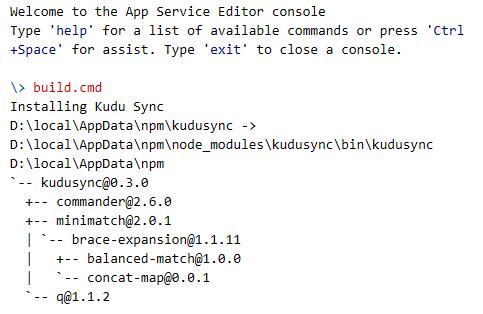 This command directly rebuilds a bot messaging endpoint app deployed on App Service. Figure 16 shows how the console window should look. After these simple steps, the bot is ready to test. 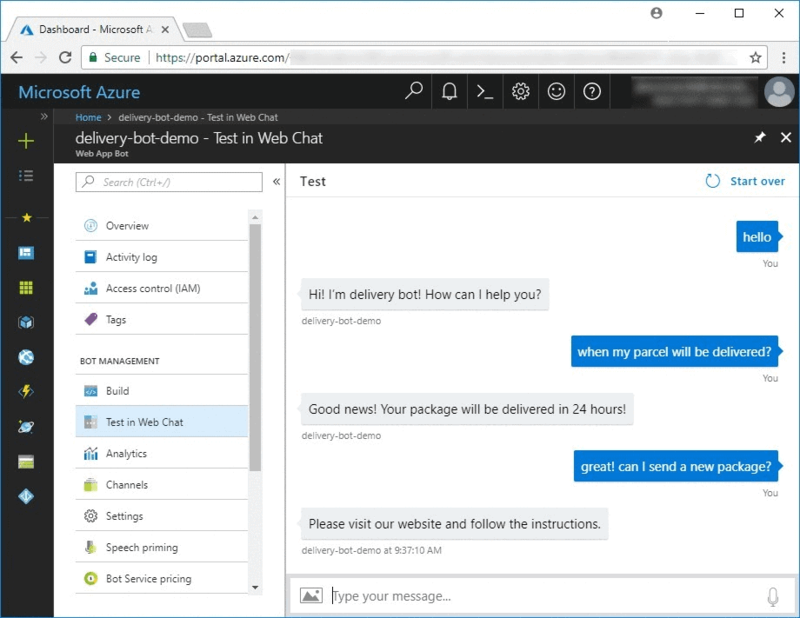 You can use a test chat component available in the Test in Web Chat section of the Web App Bot resource on the Azure Portal to start a test conversation. Figure 18 shows a successful test. The bot you have created is just a mockup. 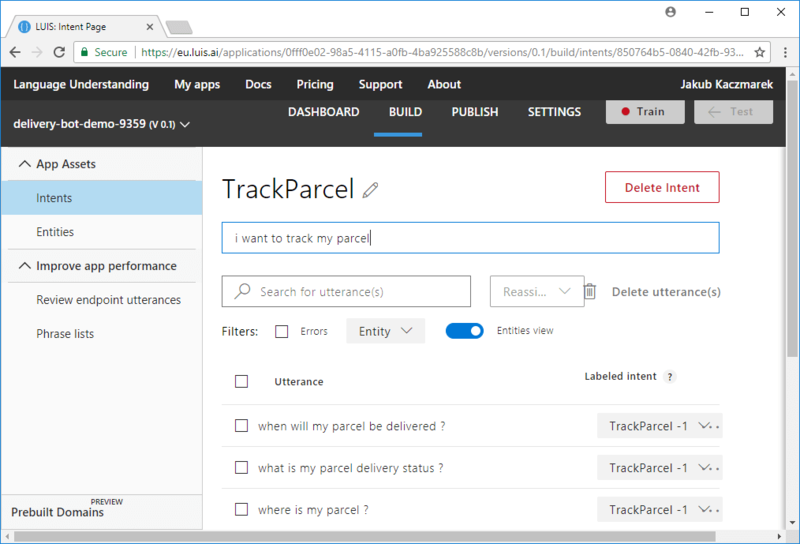 To make it more useful, you would need to integrate it with a real logistics system to allow tracking and sending parcels. The Bot will probably have more complex dialogs, allowing it to ask for some details such as parcel identity number or recipient details. These scenarios can be realized using another LUIS cognitive feature called entities, which allows it to recognize some important input data in the user message. The production-ready bot should also be available on a public channel, configurable in the Channels section of Bot Web App resource. Bots turned out to be a totally new way of creating software, and there are many areas in which they can fit. Despite the fact that the Microsoft Bot Framework approach uses well-known technologies such as the web API, the analysis and development approaches are significantly different than in case of classic web applications. That is why bot development is an exciting and challenging job. 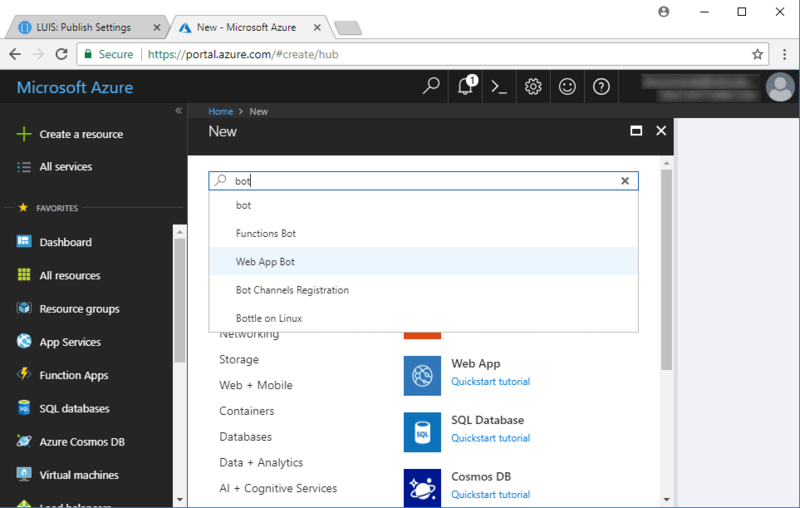 Additionally, it doesn’t necessarily need expensive tools, as the development can be done completely on Azure Portal using a web browser. In the end, a successfully finished bot project brings a lot of satisfaction for its creators, project owners, and end users. Hello, What should be the callback url ? Should it be the same domain as message endpoint ? I am trying to present user with a signin card. User Logs in and I can see the token in the emulator but I am not able to capture in the code. My call back url is different from message end point. Is that reason ?